Affordable Accoutrements: Gorillas on the Moors? Before we get started, I wanted to remind you to follow instructions at the end of this post to enter the giveaway I'm hosting to celebrate the 1st anniversary of Affordable Accoutrements. Thank you all for supporting me through a wonderful year in Blogland! If you're a blogger who enjoys setting tables and participating in Tablescape Thursdays, hosted by the inimitable Susan of Between Naps on the Porch, how do you decide on a theme? For me, it can begin with a location I want to use, a new (to me) vase, flowers in bloom, a color that keeps coming to mind, an era I want to evoke. Holidays? Not so much -- except for Christmas. I tend to work intuitively, responding to the call of one object for another, deciding whether something feels right, or seems somehow "off." Unfortunately, the bothersome aspects tend to show up most when viewing the photographs. For that reason, I tend to download a few at a time as I take them, analyze what I see, make adjustments, and then continue. Obviously the heavy fog is lifting (see below) -- I know, I'll call this one "Gorillas in the Mist!" Hmmm, that doesn't sound very appealing, does it? How about "Wuthering Heights?" Surely Cathy and Heathcliff will come rushing in from playing on the moors, famished and ready for a meal on the front porch. The mists seem to be clearing. Could it be that it was only a fogged camera lens causing the unexpected "special effects?" I suppose I'll have to remember not to rush home from work, set a table, and bring a camera directly from an air conditioned interior into a humid, 97 degree environment (following a thunderstorm!). Finally, we can now (literally) focus on the table. It's just a little table for two. The tea roses and lilies had taken a beating in the heavy rain, so I cut shrub roses (no-spray varieties) and white flowers for which I have no name. I hope one of you can enlighten me. They were planted by a previous homeowner, and they're borderline invasive (but quite pretty I think). I forgot the mint julep cups, Scarlett. We will definitely need something cool and refreshing this afternoon! You've heard of a skirted round table? This one is -- literally! It's a Ralph Lauren 100% linen skirt with a row of tiny buttons up the front. When I saw it on top of a box of clothing in a thrift store (50 cents per item), I thought it could be used somehow in a tablescape ... or as fabric for a throw pillow. I need your help in figuring out how the pocket can be utilized in this application. To hide an ace (or two) to facilitate cheating in a friendly game of cards? For packets of artificial sweetener? To hold a small flask for those times when dining with a teetotaler is just too tiresome? I'd love to hear your ideas! Looking out from the entry hall ... I can hardly wait for the crepe myrtle to burst into bloom! Can you see the Creeping Jenny spilling over the front of the concrete urns? It's one of my favorite ground covers, and it turns a very bright yellow-gold when it's planted in direct sunlight. I'm not always a fan of "chippy" white paint, but I do like that it makes these planters seem as if they've been in place for ages. They were actually purchased at a moving sale, pre-patina'd and at a very reasonable cost. Several of you have been asking for a garden tour. Here's a peek at the entrance to the "sunken garden." There's a flight of stone steps down to a wooded area that mosquitoes seem to view as their local headquarters. Otherwise, it's a lovely spot! Closer still. The one on the right is my favorite shade of pink. Wouldn't it be pretty filled with white zinfindel or a nice blush or white wine? 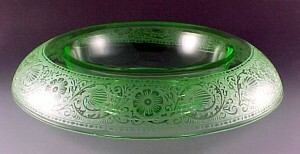 The optic pattern and etched design really capture and reflect the candlelight. Yes, I lit the candles for you. Would that they were citronella! The mosquitoes have found me here on the porch! No bites yet, but they seem to find my hands fascinating as I take the pictures. NOT conducive to steady-handed photography! Here's the River Birch tree that's reflected in the glass over the center dormer. Some of the flowers in recent table posts have been cut from this bed. Would the picture below qualify as a "blue hour" shot? I'm still grateful to Michael Lee of Designs by Gollum for bringing this phenomenon to my attention. I can see why, as she mentioned, the French rhapsodize over l'heure bleue! Susan of BNOTP did a fantastic Ideabook for Houzz recently that explains the concept and illustrates it with gorgeous photographs. She calls it "The Wonder of the Blue Hour," and you can see it HERE. The blue hour comes from a French expression, l'heure bleue, which refers to the period of twilight each morning and evening where there is neither full daylight nor complete darkness. The time is considered special because of the quality of the light at this time of day. The blue hour is considered especially flattering for people with blonde hair in photography and is often also when the smell of the flowers is at its strongest during the summertime. You can't see them in the pictures, but there were fireflies everywhere. I grew up hearing them called lightning bugs, which we children gleefully captured and placed in Mason jars (always with holes punched in the lid). What did your families call them? Were you cautioned not to touch the part that illuminates? I'd say the light outside the windows still has a bleue quality, wouldn't you? Candlelight and roses. Is there a more potent combination when it comes to romance? Did I say it's hot ... and humid? ''L'art pour l'art'' ... as the French say ... art for art's sake. As suffering for art goes, my little discomfort is minor. Go away mosquitoes! I popped the flowers into the refrigerator for the night, went to bed, and hoped for sunny weather the next morning. Can you see the color of the sunrise on the wall to the right? The Impressionists loved to capture the bright light of the midday sun. I prefer the drama of the angled light and long shadows of early morning and late afternoon! I wish you could have seen the azaleas in bloom. At the risk of sounding more delicate than I am, there was just too much pollen out here at that time. It coated every surface with a day-glow yellow-green color (I wanted to say chartreuse, but I've sworn off French for the remainder of this post!). It also gave me an instant headache the moment I stepped through the door! Allergies, sweltering heat, biting insects ... I'm making this space sound terribly appealing, no? It's actually one of my favorite spots, especially when it rains ... or snows. I forgot to say the flowers are in a procelain French basket (from Goodwill). I used a clear glass bowl as a liner to hold the water-soaked floral foam. The wrought iron furniture is new. I've looked at old, heavy pieces at numerous estate sales, but they're always in terrible condition. I'm sure a quality set would be worth repairing, sandblasting, painting ... but I'll leave that to the serious collectors. I hope one of you can identify the white flowers! I'll have to say this is some of my very favorite glassware. But don't be surprised to see it in an Etsy shoppe ... very soon! I also failed to mention that I'm using vintage glass salad plates, with an etched rose design. Another look at the flowers (fresh from the fridge!). I did snip off one drooping rose and added a few new buds here and there. I love the way the light below passes though the stemware and creates patterns on the dark green foliage. Whatever it was -- Happy Tablescape Thursday!!! 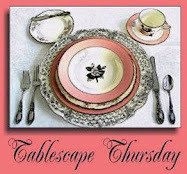 Please join Susan HERE and visit all her talented table setting participants! 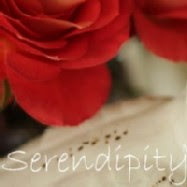 Visit my little Etsy shop HERE and let me know what you think ... and what you'd like to see there! Please help me celebrate my one year blogoversary by leaving a comment on my post HERE -- it gives instructions for entering a giveaway for Stan Williams, The Elegant Thrifter's The Find: The Housing Works Book of Decorating With Thrift Shop Treasures, Flea Market Objects, and Vintage Details. A very pretty table as always! You do things so elegantly. Love the little table on the porch -- what a sweet place to dine! Beautiful!! Love it lit up at night. Yes, I am calling my patio a courtyard. It has a few walls around it... love your veranda! Congrats on your blogaversary. I always love seeing what lovely tables you have each week. I might should stay out of your Etsy shop. With your great eye, I am sure it would be quite addicting. We called them lightening bugs, and we kept them in Mason jars with holes in the lid, too. Caught them by the dozens in the evening, and it was so much FUN! I love your Creeping Jenny, and I also love the lush monkey grass you have on either side of the walk going up to your veranda. Loved this tablescape and your centerpiece. Very lovely, indeed. P.S. I'm listening to the sounds of chain saws and a crane take a tree off of our neighbor's roof. We had a terrible storm this afternoon, and I prayed the whole way through it. This tree fell from their side yard onto their front portico which I hope is holding it up off their roof. It's a big one! And they are out of town. They always are when excitement happens at their house which, with this, makes three times! Gorgeous table as always, Bill. Love the delicate flowers on the china. The white flowers are gooseneck loosestrife, it can be rather invasive, so you might want to watch it closely! It has taken over one corner of my flowerbed...I will have to do some serious eradication this fall! This is such a beautiful and romantic table Bill! When are you opening your bed and breakfast? I want to make a reservation! lol. Honestly, this table and the lighting is just spectacular, especially at night. I love the soft glow it created! We called them lightening bugs too and I found out that I don't see as many in Wisconsin as I did growing up in Illinois. Loved the setting. As the sun set, I was waiting for a slow trumpet version of "Taps". It just seemed appropriate for a Southern hazy (ok, MUGGY) evening. What a fun post to read! I like the way you think! Gorgeous flowers, and apart from the heat and the mosquitoes (which we also have in abundance here in Texas), a very inviting scene! I love this romantic table from sun up to sun down. Yes, I believe that one photo qualified as l'heure bleue. I've become obsessed with capturing the blue hour! Your home is just wonderful too. Loved seeing your front porch. I admired the wrought iron railing in a post looking out the window from the inside sometime back. The Ralph Lauren skirt for a tablecloth topper is so clever! The fabric is perfect for the mood you presented. I need to learn how to make pictures like you do. All the shots are so good and enjoyable viewing the different times of day. Your garden looks so inviting. Yes, I am eagerly waiting to see all of it. Don't wait too long. Use the can foggers and wait a few minutes then you can go out and the bugs are better. Us gardeners are anxious to see everything. Always enjoy your commentary too. I love your romantic veranda! My favorite shots are the sunrise ones. So pretty! Mist on the veranda....should be a book title! Very sweet and romantic....you have a lovely home, mosquitoes and all! A very sweet and romantic table for two. I would love to sit there and sip wine and dine! Maybe not with the mosquitoes though...breakfast sounds nice! Really Bill it's lovely. I like the glassware and the china with the etched salad plate. Nice! How pretty this is --- and I may be looking at my clothing in a whole new light. It's been sweltering here as well -- with no relief in sight! Breathtaking as always! How you do it, I do not know! It is all gorgeous, but I cannot stop looking at the railing, lol! I imagine a wrought iron base with that pattern for one of my tables. Beautiful! I had to go back and view the pictures a couple of times once you described the Ralph Lauren skirt. I thought I mis-read. What a beautiful print and what a clever way to save it from Death Row in the Thrift Shop. The pocket? I'd use it for my glasses. They're always in the way! Gorgeous table. Sigh... Despite the mosquitos and the humidity, I don't think I would be able to move from this spot. Everything is so specially chosen and the overall effect is just wonderful. I must sigh again... Beautiful! Bill, I love your veranda...the brick floors, iron railings, urns and of course your beautifully set table. Thanks for sharing this beautiful spot with us. Definitely a veranda. It was just stunning and fun to see it in so many different lights. I am glad the fog cleared - mysterious as it made it. Absolutely loved the table linens. Oh, my dear, of course you have a veranda! With curvy wrought iron, ferns, stained glass and mossy brickwork -- not to mention julep cups at the ready -- how could you possibly call it anything else? And, yes, we call them lightning bugs here, too. At the risk of being overly dramatic and showing my affinity for old movies about the war of Northern aggression, my first thought for your tablecloth pocket was a pretty, little, pearl-handled derringer, just in case a lady had to defend her own honor with all the menfolk away fighting. It's a wonderful table, Bill. You have a lovely home with a perfect veranda! As usual, you have set another beautiful and stunning tablescape. How creative of you to use a skirt. Talk about being thrifty and creative. I love layering. Yes, we call those little bugs, lightening bugs. My boys are catching them the same way you did as child. I have no clue what the white flowers are called, but the arrangement is breath taking. I was taking some outdoor shots today, and I had the same problem with my camera lens too. It has been soooo hot and humid lately. Thanks for sharing! Bill, this is sooo gorgeous! I love your home...you have so many pretty places to set a table! I'm with you on the evening and morning shadows...you captured the light beautifully in your pics. Your blue hour pics are wonderful...it is such a fascinating thing, isn't it? Your photography had me spellbound. Congrats on opening an Etsy shoppe. I know you'll have it all stocked before long with your amazing finds! Hi Bill, very lovely table in a lovely area with lovely glimbses to your thoughts. Every photo is a feast for the eyes and the best is, when we enjoy virtual, the mosquitos cannot get us. We have in Germany also Lightening Bugs and we call them Glühwürmchen (little glowing worms). Dont ask me why, because worms usually don't fly. But I have seen them once in a meadow in USA and it seemed to me as if the american Lightning Bugs were bigger. I always look for your tablescape first - you do such an amazing job! Greetings Bill~ ~ ~Veranda it is then. It certainly looks elegant to me. Wish I could be there in the heat and enjoy a julip with you. I have been making them this weekend, heck all summer long. They are most refreshing with my peppermint essential oil. It's much easier than locating and mashing fresh peppermint! I really must post the recipe. I have taken to calling my sunroom the conservatory because I think it is a so much more elegant name. I really must look up the defination of the two and see if I'm just dreaming. Dreaming makes it so, isn't that right? Loved this post and your front veranda is stunning. That window makes me just swoon! Good reason for another mint julip. i really loved your tablescape. your photography and narration were wonderful as well. thank you so much! i feel like i have just had a relaxing visit with a good book! I love your blog. found it through BNOP! Your table setting is inspiring and beautiful and calm and serene and I love it! Bill-I'm inspired and jealous! Inspired by your beautiful table and jealous that you live where things can be lush and green. High mtn valleys don't quite get that way! Thanks for sharing your beautiful things with us. As usual, I just don't have enough adjectives in my vocabulary to describe your tablescape. I drool over every single picture. I like it in the afternoon and evening (especially with the candles, of course) but the morning is febulous. I had to laugh about turning the candle holder up-side-down for votives. I do that often as my tables are much less formal (and less dramatic) than yours. It is breathtaking. Lovely tablescape! I love all the ferns out and near the veranda. Thanks for sharing and have a great day! Bill, what a grand tablescape outdoors! I am so loving the ferns! I want some now, thanks to that great inspiration! What beautiful shots of a beautiful table Bill. Your home is gorgeous. The ferns are perfect for this setting. I always enjoy stopping by. Love your blog and now I want to see your sunken garden too! I already left a comment and Congratulations on your anniversary! Beautiful morning on your porch! I would enjoy it anytime! As usual your tablescape is so gorgeous and inspiration too! Love those beautiful flowers as well! And Yay! You did capture the blue hour! I am excited to see you have an etsy store now also! Hi Bill, Admiring your beautiful setting and I think I have an answer for your white flower question. The white flower appears to be a White Icicle Speedwell Veronica, better known as Veronica OR Speedwell. It is an an easy to grow perennial that blooms from June until September. Deadhead the spent blooms to prolong its bloom time. Love the mix of floral and glass to make one cohesive table. It's lovely on the porch, says I, as I sit inside this afternoon in CA under a nice fan. I would trade my tract home for a quiet porch and green garden. Thanks for the table. Love it. Hi Bill, So nice to visit once again. First of all, the flower is gooseneck loosestrife. If you google it, there are a number of google images that come up. It's interesting that you mention it seems a bit invasive; a "relative", purple loosestrife is banned in Iowa because it is so invasive that it is causing problems in the waterways. I saw some at a small trout lake last summer and I called the DNR to let them know. But, on to your post: and what a nice post it is. Thanks for the views outside! Beautiful! I love your etched pink stemware; is it depression glass? How creative you were with "dressing" your table. lol Your new wrought iron table and chairs is a nice set and you've made it lovely. I like your blue hour shots, and I love, love, love your very last photo. There was a LOT to look at and read about in this post, and I enjoyed every bit of it, Bill. Another tastefully beautiful table. Love your veranda area. I have fond memories of catching what we, too, called lightning bugs. And no, you sure don't want to accidentally squish one and get that yellow part on your hand. Ewww. Bill-Happy one year blogaversary--You have been an inspiring and entertaining addition to the Land of Blog! So glad to see you with an etsy shop--love the pink vintage glasses!. I caught lightening bugs on the front porch as a child, never fireflies on the veranda :) And that reminds me-- we also chased after the "fogging machine"--you know, the one that sprayed PESTICIDE!! :) It's a wonder any of us lived! Love this post! Bill, YOur table on the veranda is one I must come and sit down at for a spell! I want to unfurl the napkin and sip wine from the pink crystal goblet and eat from those beautiful plates. I want to make small talk over the lovely arranged flowers and rest my elbows (sorry) on that beautiful tablecloth and skirt with the buttons. No need for the flask, I'll have another glass of wine, please. After dinner, as the fireflies come out to light up the blue hour, I want to turn my seat and watch their show! Then when the lights give off that wonderul pink glow, I'll have dessert. This will be a relaxed and fine evening, won't it! You paint a fabulous picture with your tablewares! This is the picture I see! This is my first time visiting you. I loved your table. The white flowers are gooseneck loosestrife. I have some in my garden here in Canada. The gooseneck loosestrife can be a bit invasive, but don't try to get rid of it as a friend did -- she rototilled the bed. Big mistake, as it regrows from root pieces. Love your "special effects". Your tablescapes are breathtaking. Thanks for sharing some of your garden with us because your floral arrangements are always so beautiful. Bill this is all just truly amazing! I just love your gorgeous home and porch photos. Your tablescape and china pattern are very unique. It is a special post. Thank you for sharing such incredible beauty with us. This is just gorgeous...I love the morning light & shadows of your iron railing and stemware! I'm late in visiting and see your gooseneck loosestrife has already been identified. We made the mistake of planting some~ while the blooms are gorgeous it is incredibly invasive. oh, my... love the blue hour note - i'd never heard of that before...so fitting. there's a time in fall when the light changes in the evening, nothing like it. the skirt as a table cover - loved that, too! Beautiful post as always. I love the skirt as a tablecloth. I would vote for the flask or the pearl handled pistol. I am off to your Etsy shop now. Have a wonderful week, Bill. Your tablescapes are always so lovely, they just blow me away. I love the pink crystal and have been looking to purchase some just like those. This is absolutely lovely, Bill. The intricate scrolls of the white wrought iron chairs is so appropriate for a southern *veranda*! What a cool, foggy effect the humidity had on your lens! I'm sure you worked up more of a sweat doing this little table for two than you do setting places for eight inside. I have the Creeping Jenny growing in my front pots, too but its not as far along as yours. The gooseneck loosestrife is striking in its arched appearance. The roses mimic the colors in the china beautifully, too. What a magnificent shot of the front of your home, with the lights ablaze & the stained glass transom lit from within!! Thanks for commenting, I am honoured! !